When James rang the other day and said he'd really like us to do another round of recording, it was, quite literally, music to my ears. We've done a few sessions together over the years and he really has helped shape a lot of my songs. I may have provided the playground, but James was the one who put the swings and roundabouts in. That's not my quote by the way - when Nigel Clark walked out on Dodgy 20 years ago I remember Matt their drummer saying it might be Clarks's name on the records, but they all know how the songs really got written and recorded. Ouch. And another one I'd like to have a crack at is My Brother Jake. 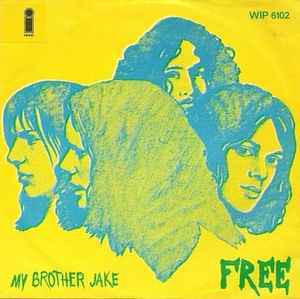 Free had a huge hit with it in 1971, but, again, I want to do it more like the Eiderdowns; so chilled we may all end up getting hypothermia. Let me make a few phone calls and see if we can't fix this up for early in the New Year. As a general rule, when it comes to cover versions I like to see something interesting done with the original arrangement, to make the whole endeavour worthwhile. Having said all that, The Eiderdowns treat 'From the Beginning' with such care and attention to detail that I immediately chucked out that self-made rule. It's a very beautiful thing indeed. Thanks for bringing it to my attention John. (I'd like to hear their run at 'My Brother Jake' too, but the link isn't working). I'm with you TS. Always bring something new to the table, indeed. Yet, and yet...as you say, From the Beginning is sublime, isn't it? Links - I'm gonna stop using box.com and switch apps. Who do you use? Feel free to take this off line; I've also asked Alyson who she uses over at her excellent blog. Having said that, I've just tried to open it and it's got thru first time. It's a bit hit and miss, so will definitely change it over. I use Box and (touch wood) have not had an issue thus far. Still can't get through to Jake btw. Sorry - should have left my comment here. I just sent you an email with the screenshots attached. Let me know if you need any clarification. I'd like to hear My Brother Jake, too. No luck. Maybe later? Right...I think I've cracked it! Give it a go now. I'm using a different platform - they go by the name of Mega and it seems to be behaving itself. Please let me know if you encounter further problems. Result! And well worth hearing. Thank you. Great news Martin! I may go back and convert some old ones to the new format; not least Jinski's 'Tick Tock' from my last post. Finally got to it. Very good. Is there more stuff by these guys on the interweb?